Two weeks ago, my side project Further had one of its highest traffic days ever. If you’re not familiar, Further is a personal development email newsletter in which I curate content from around the web. It’s basically whatever I find useful and interesting related to health, wealth, wisdom, and travel. So what sparked the traffic? After all, the newsletter’s primary function is to send traffic to other websites. Was it a significant social share from a relevant influencer? Did I spend a fortune on a pay-per-click advertising campaign? Had I caught a link in another personal growth newsletter? It was indeed a link from a personal growth newsletter. Only thing is, the link was from me, in the Further newsletter itself. After adding the category of travel to the topics I curate for the newsletter, I also decided to test including original travel articles on Further.net to see what the response would be. Long story short, I met a travel writer at a conference in Austin, which resulted in The French Riviera for the Rest of Us, an article that shoots down the myth that la Côte d’Azur is only for wealthy movie stars and international men of mystery. I first built an email-based audience with curated content, so that when I moved to original content, it would get guaranteed traffic. In fact, that article got tons of clicks, because after two years of serving the audience, I knew it would be a hit with my subscribers. Let me give you another example. After more than a decade, Copyblogger gets massive amounts of organic traffic every single day from search, social, and 150,000 RSS subscribers. But when is our biggest traffic day each week? It’s Thursdays, when we publish the Copyblogger Weekly email digest to more than 222,000 people. You’re getting the idea. 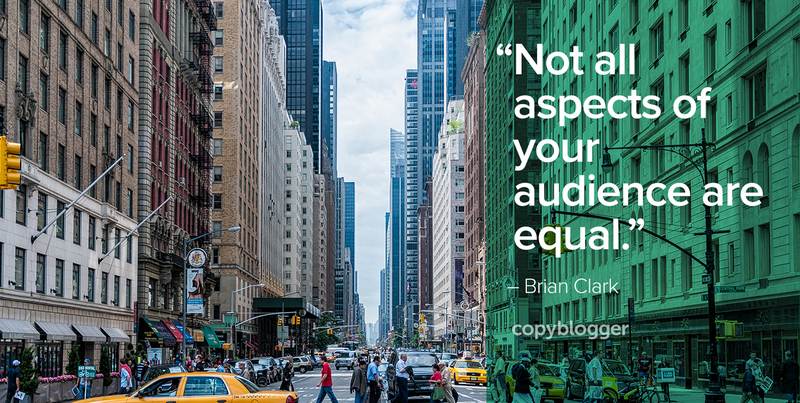 What we teach here at Copyblogger is simple — build an audience with valuable content before you start selling. And in some cases, before you even have a product or service to sell. Now, the audience of an online publisher has multiple components — social platforms, search engines, YouTube channels, podcast subscriptions, RSS, and email. But not all aspects of your audience are equal. Email is far and above the most valuable audience channel. Some people have known that all along, and others have made email a priority even though they have big crowds on other platforms. And yet, social and search get all the attention. It’s completely lopsided. I have 185,000 Twitter followers. A tweet of Further content will get me around 20 clicks. Twenty bucks on a boosted Facebook post of the same content to 5,165 people who like the Further page gets even less. But a link in my newsletter? More than 2,000 clicks from an email list of less than 7,500. And sure, high search rankings are gold, Jerry. But as we recently discussed, if that traffic leaves without joining your real audience (i.e., email), what was it really worth? Which brings us to the next big point. Email sells. When it comes to content distribution, email seems to be the forgotten hero. The focus is all on going viral on social and hitting that top ranking in Google. But you may be better off just intently focusing on building the right list of email subscribers. Yes, those steady traffic blasts to your content can help with social and search, but they also drive what you’re really after — sales. No matter how effective your social media and SEO efforts are, the place where prospects convert to customers and clients is still email. You know you need to build an email list. And search and social are indispensable for accomplishing that. But it’s also important not to chase traffic for traffic’s sake. You only want traffic so you can sell more of your stuff. You’re not going to build an email list of valuable prospects without the promise of valuable content. But once you get them on the list with your promise, why not just spam the hell out of them with your offers? That approach seems to be back in vogue among the get-rich-quick crowd. But today’s savvy prospect is more likely to unsubscribe as soon as the pitches start, and then say ugly things about you on social. The reason you continue to deliver valuable content beyond your initial promise is simple. You’re training people to open your emails and click on your links by being consistently amazing. My esteemed colleague Sonia Simone thinks of this as treating your prospects like dogs (but only in the nicest way). I’ve always been a bit squeamish about the dog analogy, but you get the idea. You want your emails to be not only opened, but anticipated. Trust me, when the occasional offer comes, it will be viewed with a much more accepting frame of mind than otherwise. And that’s what you want. The internet moves pretty fast. But email — the original “killer app” — persists as the backbone of it all. In an upcoming article, I’ll walk you through how to approach building your email list. You’ll see that when it comes down to it, a smart content marketing strategy is primarily an email marketing strategy. Image source: Frank Köhntopp via Unsplash. Thanks Brian, I am very much looking forward to your next article about building email Lists. This is something I am in dire need of. A lot of the time, your content is what makes you the sales. By giving people your knowledge for free, you build trust, and suddenly you’re the big name in your sector (your final point really resonates with me, Brian). There are about 2-3 different ‘names’ that I really look forward to when their email drops in my inbox, and I click through to their content every time. Linking at its finest! Further just gained its newest subscriber. Looking forward to receiving my first newsletter… AND learning how to build my company’s email list when your next article is published. Thanks Brian! Great job Brian, this was so informative! I couldn’t agree more about e-mail being the forgotten force. The emphasis nowadays is so focused on social but people forget that it is e-mail that has the highest conversion rate when it comes to purchases made after receiving a marketing message. A quick question, how do you stand on mail shot frequency, say per week? I know there are different guidelines for different sectors, but I was just looking to pick your brains. Our current thinking is that one consistent email a week is ideal. But that doesn’t include other email sequences that the main audience might opt-in to, and special promotions. Thanks, Brian, great article. You really inspire me to create great content and get it out there! Brian your traffic strategy is great. Your post is short but very informative. Off topic, I like the way you are creating landing page master images (A relevant background and a quote with your name and brand). I sense the same pattern in “further” too. Been reading this Copyblogger thing you guys been putting out for a while now. And this piece goes hand in hand with your audio series about Email at Unemployable, which I hope everyone takes a moment to check out. Been nodding my head as I read through this post. Content has always been the best way in converting sales. Combined that with email and social media marketing and you’ll definitely get the job done. The problem here is that business owners should focus more on their business, not on producing content. Time, after all, is of the essence when running a business. So why not bring specialized writers to get the job for you? Hey Brian, thanks again for the great information – you never disappoint. If you don’t mind me asking, do you have a “favorite” way of collecting email addresses? In my many months of trial and error I’ve learned that guest posting with a backlink to a landing page (from Unbounce) has worked best for me, but I’m just seeing if there’s any better options out there or if I’m on the right track. I’m in a puddle on the floor. This is fantastically put, and I feel like I need pom poms I’m cheering so much. Thank you for this! Really true to the core. But as a newbie it is hard to get email subscribers without any huge social media followers. How long do you recommend webmasters to wait before promoting through email. I have had newsletters with 200 plus sign ups that have come in at a trickle over several months. The only thing I have emailed them is digests about posts at my site. Open rates are about 45%. Is that enough level of engagement to believe that my audience could be sold to. No doubt emailing your subscribers is a sure way to get traffic to your site. But getting people to sign up for your newsletter is one thing especially these days. It seems people are already getting tired of putting their emails on every sign up form out there. Still worth the effort though. I didn’t realize Twitter engagement is that low. I am currently testing it myself, getting a few clicks per tweet, which is at least something. I do notice Facebook is getting more clicks per post than Twitter. My fear with starting a newsletter is the constant pressure of sticking to the schedule, along with actually having something to publish. But same goes for social, and seeing these numbers, I should really think of a better newsletter strategy. Brian, Your content is top notch and your unemployable podcast is one of my favorites. I never miss an episode! This is a great article which deserves another read. I look forward to the one where you walk us through how to approach building the email list. How does one do this without buying those underperforming FB ads when starting from 0? At the beginning, don’t we have to interrupt some people who don’t know us yet, but we’re sure we’d get along great with, in order to get to the anticipated permission marketing part where we deliver great content to people who care? Hello Brian, thank you for the excellent post. The greatest problem I have now is maintaining an email list with my blog. The hassle of producing content takes enough of my time that I usually don’t have the time to pursue list. Maybe I’ll have to look around and see if there is a guide for busy people who want to build their own list. I think it’s just a chance in perspective — you create content to build the list. It’s not two separate things. Great article, I need to start making an email list for my blog, but I’ve been so busy with content and research that I haven’t had the chance yet. Next month I might try to start to build my email list, once again thank you for the tips! One of the better “you need a list” posts out there! Good luck with Further, Brian.